Ever wondered what you could do to make your bag look and feel as beautiful as possible when selling it? Shian of the legendary NaughtiPidgins Nest was kind of enough to share her secrets with us, so look no further! Shian, what are your top tips on preparing a bag for re-sale? "I am often asked about care and maintenance of bags and tend to refer folks over to my Leather Guide, for information on particular leather types and finishes. 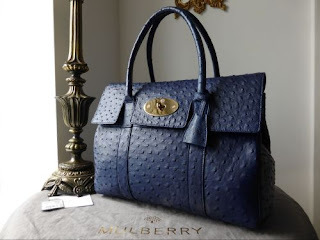 However, I thought it might be useful to provide some guidance on how to prepare a bag for resale, whether you are thinking of selling at the Nest or anywhere else. When you buy a preloved bag, irrespective of how much wear its received, everyone wants it to be clean, tidy and odour free. There are just a few simple steps you can take when you a recycling your bag, to ensure that its in the best condition possible and your buyer is delighted. Whether your bag is suede lined, self lined or fabric lined, the interior need to to be brushed out. If it has a fabric lining and can be turned out, gently pull the lining out so you can brush, making sure to turn out the corners where all the dust and bits collect. Do the same with any zip or slip pockets and make sure any hairs and fluff that often get stuck between the stitching is removed. On unlined bags or ones where the inside stays 'in' the bag, turn it upside down and brush out gently, again making sure to get right into the corners, nooks and crannies. Don't forget any hidden areas, like the base of a Bayswaters flap, where it joins the bag, as spaces like this collect bits more than anywhere! After you've brushed, on to a really thorough cleaning of the seams and harder to reach places. For this, just wrap some cellotape, sticky side outwards, round your index finger and run it along the seams. It will pick up the last of the fluff and hairs and after renewing the cellotape several times, you'll be surprised how much debris you collect. For lined bags, you can then wipe the material with a moistened baby wipe to remove any light marks or stains. Don't scrub as you may damage the fabric but clean as best as possible and ensure its all dry before putting the bag away. For unlined or suede lined bags, you can use a lanolin free leather wipe but again, don't scrub as the pile will be damaged and possible look worse than the stain did! For the exterior of the bag, your cleaning technique will again be dictated by the finish. A lambskin or very fine nap leather bag will require a much gentler approach that something like Natural or Darwin and I'd always recommend using some light cotton gloves for the more delicate hides to prevent any oil or grease transfer from your hands. For quilted bags or those with intricate stitching, sequins or beads, use the soft-bristled toothbrush to gently dust the outside. Do the same with any chain and leather intertwined straps and around hardware and closures. Then, gently wipe over the exterior of the bag with the lanolin free cleaning wipes, taking care to sweep lightly over the surface so that no areas darken or 'soak' the moisture into the hide. Patent or demi-sheen finishes will require buffing to remove any residual smears and hardware can also be buffed, taking care to ensure there are no 'bits' on your cloth that will scratch the metalware. For more used bags, you can sometimes improve on areas of wear and or dryness, by the use of moisturising products. Dependant on the nature of the leather and the severity of the wear, a light spritz with a Leather Shine spray and buff with a lint free cloth can bring back a lovely lustre to the hide, especially on smooth leather bags. Very dry areas such as corners, can benefit from a more intense application and a leather balm, warmed in your hands and then massaged evenly into the hide, which can help replenish some of the lost moisture and oils........ but please remember, if you are looking to 'restore' your bag prior to sale, then its best left to the professionals. I am always happy to recommend some really good companies, so just get in touch as I'd be delighted to assist." Toothbrush and cellotape - who would have thought?! This post was chosen by Independent Fashion Bloggers as one featured in their Links à la Mode for that week. Do have a look at the other brilliant posts below.